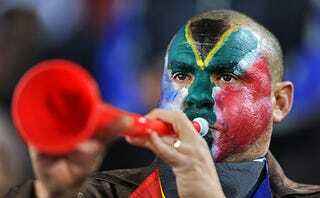 We're two weeks into the World Cup and the obnoxious drone of the vuvuzela hasn't abated. Fear not, Stardock, which published Sins of a Solar Empire, made a free app that strips the horn's noise from streaming broadcasts. World Cup fans have no doubt seen other vuvuzela filters and how-tos for driving down the range at which this toy horn drones on your high-end TV's equalizer. This free app, built by Jeff Bargmann, Stardock's chief technology architect, in collaboration with the Centre for Digital Music at Queen Mary, University of London, covers anything coming over your PC - BBC, ESPN3 or other video source. It runs on any Windows system operating XP or better. But if you have a Mac, worry not, there are devuvuzelinators for that, too.